Lets just get this out of the way, shall we? Microsoft really shouldn’t allow its CEO, Steve Ballmer, out in public any more. Every time they do he seems to inevitably find some way to shove both his feet in his mouth as quickly as possible. Speaking at the Web 2.0 Summit, Mr. Ballmer was being interviewed by summit co-host John Battelle about a wide-range of subjects, and it eventually turned to what is going on in the mobile space with Windows Phone vs. the iPhone and Android. While he took a minor jab at the iPhone for having a sea of apps to wade through to get to the information you want according to eWeek, it was his feelings about Android that really grabbed everyone’s attention. You don’t need to be a computer scientist to use a Windows phone, but I think you do to use an Android phone. It is of course understandable that Mr. Ballmer is going to talk up his company’s operating system compared to the competition, but he is also known for his tendency to be a tad grandiose in his statements and actions. This is certainly a prime example of that issue in action. I know many people that don’t have degrees in computer science that seem to be able to use Android perfectly well. And no, they aren’t all tech bloggers, but instead come from all walks of life: Delivery men, waiters, office workers and even my own mother. While we’re sure Ballmer was exaggerating his perception of how difficult Android is to use for dramatic effect, considering its share of the mobile operating system market, it was just a silly thing to say. Of course, we are talking about a man who really, really likes developers. Ballmer will always be entitled to his opinons, but at some point someone should really talk to him about watching how he words things when speaking on the record. 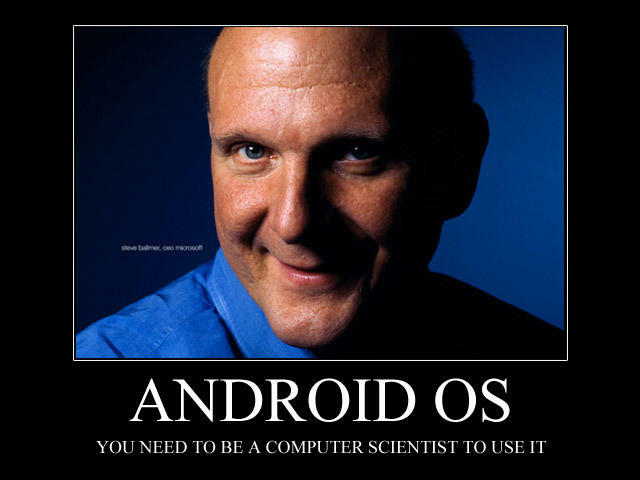 What do you think of Steve Ballmer’s comment about Android?